You are currently browsing the tag archive for the ‘arctic’ tag. ‘The Playful Polar Bears’ starts with just that: playful Polar Bears. Soon, we follow a disobedient little bear, who wants to catch a fish without entering the ice cold water. When a bunch of hunters arrive, all bears flee into an ice cave, except for the little one. When his mother finds him, she thinks he has been shot, which leads to an overlong mourning and funeral scene. Of course, the little one is unharmed, and in the end shot we watch the polar bears being playful again. With ‘The Playful Polar Bears’ the Fleischer brothers hark all the way back to early Silly Symphonies like ‘Arctic Antics‘ (1930) and ‘Birds in the Spring‘ (1933), without adding anything new. It’s a great example of their misguided plagiarism of Disney’s Silly Symphonies series: there’s a protagonist, but nothing to let him gain the audience’s sympathy. There’s emotion, but it’s played out in the most standardized way. Thus in no frame we’re able to feel with the mother polar bear, whose emotions remain abstract and generic. Besides, the story lacks inner logic. In the opening shots it’s clearly established that the little polar bear hates the ice cold water, but nothing is done with this information. Moreover, the hunters are finally defeated by the deus ex machina of a snow storm, which sends their ship home. So, in ‘The Playful Polar Bears’, there’s a lot happening on the screen, but nothing that’s remotely interesting. Films like these painfully showed what Disney had and what the Fleischers lacked. Luckily, they also made Popeye cartoons, which showed that the Fleischers really could make enjoyable cartoons, because in the Popeye series they could play their own game, instead of trying to imitate somebody else’s. ‘Frozen Frolics’ is the third of four cartoons featuring the obscure duo Waffles & Don. In this short they are on their way to the North Pole to steal the pole, which looks like a barber’s pole. After they lose their sled due to an obstinate rabbit, we suddenly cut to arctic animals dancing, much like Walt Disney’s ‘Arctic Antics‘ from two months earlier. Only after a while we return to the duo, whom we watch being exhausted, and trudging through a snow storm. When Don seems to be dead, Waffles steals his money, and eats his shoe. Luckily, Don is alive after all. But later Waffles doesn’t hesitate to throw his little friend to an angry bear. Don beats him up for that, with which the cartoons ends. The animation in ‘Frozen Frolics’ is wildly uneven, and more often than not rather out of sync with the music. ‘Mail Dog’ is another arctic short featuring Pluto (see ‘Rescue Dog‘ from eight months earlier). This time Pluto is a mail dog in Alaska. While delivering the mail he encounters a totem pole and a chilly rabbit. When he chases it, he accidentally delivers the mail in time, too. This short follows the typical Pluto story, where Pluto befriends a little animal he dislikes at first. Unfortunately, there’s absolutely nothing special about this particular entry, making it one of Pluto’s most forgettable cartoons. 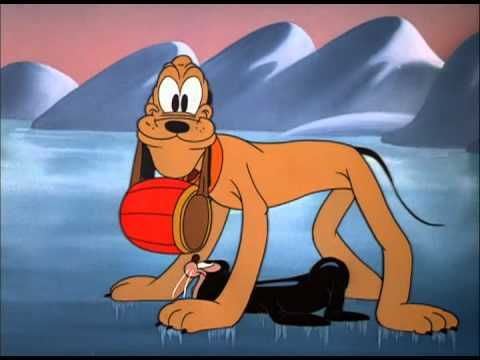 Pluto somehow is a rescue dog in the arctic, where he encounters the little seal from ‘Pluto’s Playmate‘ (1941). In a story all too similar to this earlier entry, Pluto tries to get rid of it, but when the seal rescues him from almost drowning, they become friends. This is one of the more forgettable Pluto shorts in which Pluto befriends a little animal. Its story is told quite slowly. However, it contains some broad and funny animation of Pluto. The seal would return the following year in ‘Mickey and the Seal‘.